Original painting SOLD (commissioned artwork). 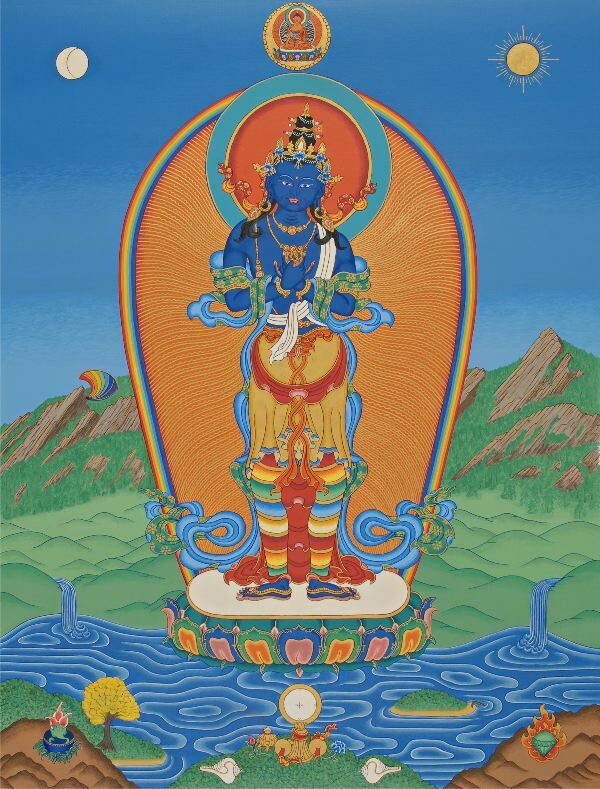 Vajradhara (meaning Holder of the Diamond Sceptre) is the primordial Dharmakaya Buddha or Adi-buddha and represents the essence of the realisation of enlightenment. Vajradhara is depicted in the Vajraparyanka (embracing) posture, holding a Vajra and a bell. He is usually depicted in blue colour, symbolising limitless space or consciousness, with the crown, Urna and Ushnisha of a Sambhogakaya Buddha. Shakyamuni, the historical buddha, is said to have appeared in the form of Vajradhara while he was teaching his gifted disciples. The royal guru Padmasambhava also appears in the form of Vajradhara in consort with Yeshe Tsogyal.